Just twinkle your nose to realize 2014 marks the 50th anniversary of the iconic sitcom “Bewitched” from the 1960s. 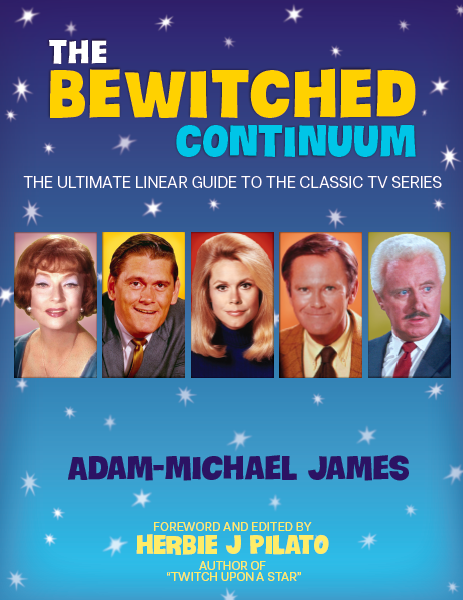 It’s magical, it’s true, and to celebrate this milestone author Adam-Michael James has penned “The Bewitched Continuum,” a delightfully insightful and thorough look into all things “Bewitched” and its bewitching facets. We can’t get enough of it. Fans of the show, like us, will love looking back at each of the classic shows eight seasons and 254 episodes that ran from 1964-1972 on ABC. It features an overview of the highlights of each year’s run, along with a detailed synopsis for each episode. Also, decades-old questions are answered like… "Do witches fly on brooms? ", "Can one witch undo another witch's spell?" and "Do witches have power over one another?" It has lived in the hearts of all of us since the series first debuted. "When I was eight years old, I fell in love for the first time," says author James, explaining his life-long fascination with "Bewitched." "I sat in front of the television and saw a blonde lady wave her hand and make a strange gesture with her nose. Suddenly, a bucket of water appeared over a man who had been bothering her, and, by the time the bucket emptied itself on him, I was hooked." Plus, the author genuinely loves the subject. An expert in continuity, James has a long history in the entertainment industry including writing script coverage for major production companies and writing continuity scripts for radio. His literary output includes the book and lyrics for the musical drama "The Nine Lives of L.M. Montgomery," "Extra Extra: Memoirs from a Piece of Human Furniture," a humorous how-to tome on being a Hollywood extra, and the novel "Undo the Deed," a time-travel story that was influenced by "Bewitched." Currently, he is a columnist at soapcentral.com where he writes extensively about the soap opera, "The Bold and the Beautiful." The best part of this book? The last and is aptly titled chapter, “Within the Contiuum” – is a must-read first. Here, fans can find interesting trivia and facts about the series. Ever wonder how many times Samantha twitched her nose or how many times Endora called Darrin Durwood, as well as other D-names. Want to know the number of times Larry fired Darrin or the complete list of McMann and Tate's clients? All of this and more is featured in this great chronicle of a show that captured America's zeitgeist 50 years ago and continues to have millions of adoring fans to this day - long may “The Bewitched Continuum” continue into pop culture lore. All photos are courtesy of PHOTOFEST.